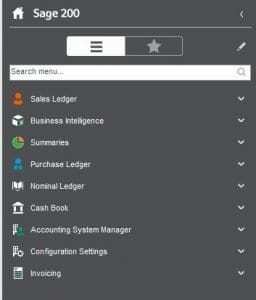 In 4 Ways to Simplify your Searches in Sage 200c we looked at searching quickly and productively with Wildcard Symbols and Keyboard Shortcuts – Alt keys and Function keys; the advantage of List Views and how to configure them, and Applying Filters to List Views. 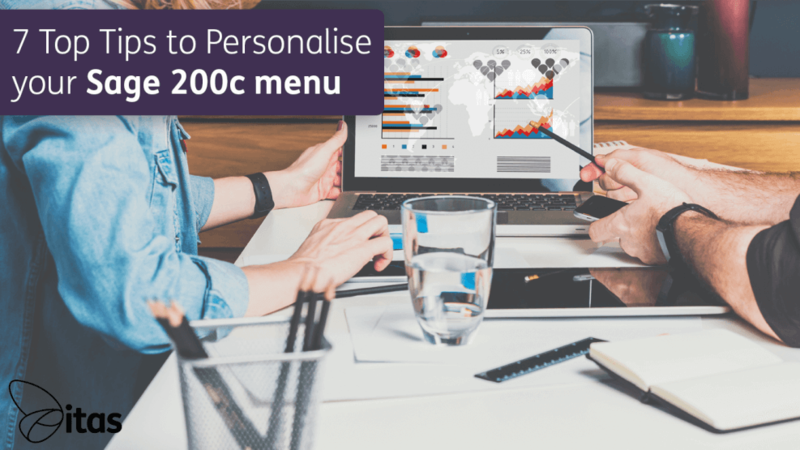 In this blog, ‘7 Top Tips to Personalise your Sage 200c Menu’ we are going to look at customising Sage 200 to find menus and relevant information faster and process maps to simply the flow of processes. 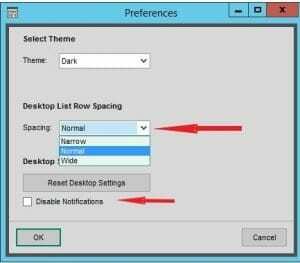 You saw how to configure the List Views to show only the information you want to include, but did you know you are able to change the spacing in those list views to fit more on your screen or spread it out for easier reading? Select the settings (cog) icon on the top right of your screen and select Preferences from the dropdown. 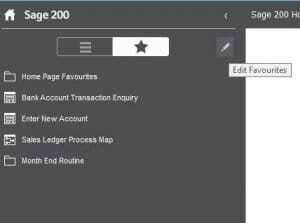 The Sage 200 menu can become very cluttered as you expand the menu items. The right-click ‘Collapse All’ function is an essential function especially if you have lots of add-on modules which can cause your menu to grow out of control. ‘Collapse All’ will immediately collapse your submenus, showing only the main menu items. The Search Menu is another useful feature to extract the feature you are looking for when you don’t know which menu it’s in. will show where in the menu the item you were searching for is hiding. And this is where the Fabulous Favourites comes in! Right click on the menu item and select Add to Favourites to add it to your very own, customised menu which will hold all those menu items you use frequently. and add a folder in your Favourites to make a group in your menu, where you can store all the menu items for a particular function, eg Month End Routine. 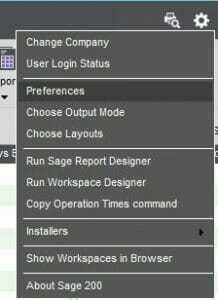 These are really useful, especially if you are new to Sage 200. Stock, for example, is handled in a specific order as it travels from a quotation, through the order process to invoice and finally posting. The order is very specific, stock needs to be allocated before it can be picked, and must be dispatched before the invoice can be printed, and only printed invoices can be posted. 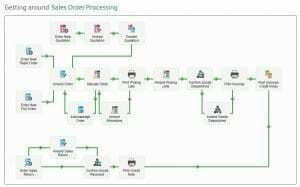 Enter the interactive process map, which shows the order for each process. Launch the map and mouse-over each little icon to see how your cursor changes to show they are all interactive. Click on the icon to open each screen, in the correct order as shown on the map. 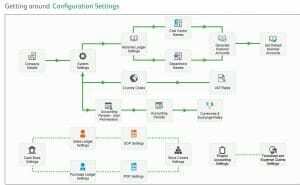 My favourite is the Configuration Settings map. 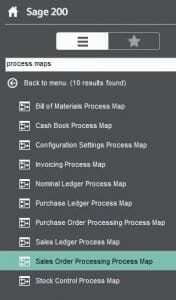 As there is a Utilities menu in each module in Sage 200, this map is especially useful for setting up new systems. 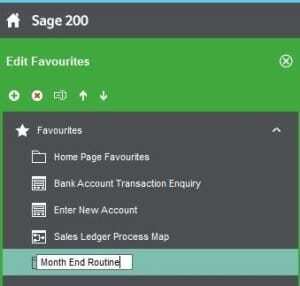 It will guide you through each section of Sage 200, ensuring you don’t miss the configuration of any module. 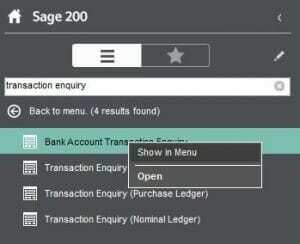 This is a brand new feature added to the latest Sage 200cloud update. 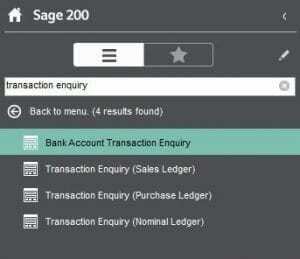 If you have been using Sage 200 for many years you will immediately recognise the value of this addition. For companies that deal with large amounts of customers and/or suppliers you will know that, over time, the number of both of these can grow at quite a rate. You can’t remove customers and suppliers who are already associated with a transaction, but you can hide them. Active suppliers and customers are not a problem, quite the opposite, in fact! It’s the inactive ones which can become quite problematic. Backups can become unnecessarily enormous, searches can take long and your system will become sluggish with all the data. 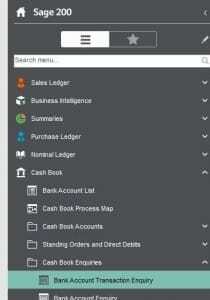 We know we can perform filters to remove inactive customers and suppliers but that is yet another function you won’t need to perform with the new ‘Hide’ feature. 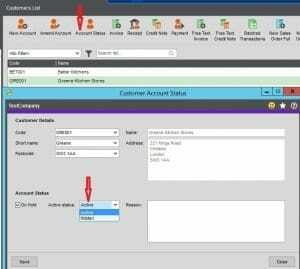 Or Right click on the customer name in Customer List view and select Actions > Account Status. 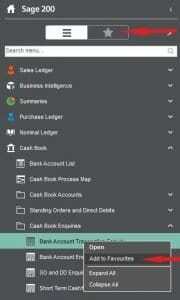 NB: Hiding an account will mean they will not appear on any reports, list views or document selections but will not exclude the customer or supplier from transaction searches. 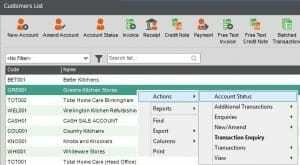 In the next episode of Sage 200 Tips and Tricks – Features and Functions, we will look at Transactional Enquiries, the Send to Excel function, using Sage 200 to control your Fixed Assets and a neat tip to easily identify a company (in a multi-company system).